I know you keep being asked for stock market forecasts, but can you at least give us a clue as to where you think the market is going in the short term. A number of commodity stocks are at break out levels. Is this another false dawn, or something more significant? 19 Jan 12, 18:46 Could we still be in a deflation? Nadeem, I've recently drawn an S&P chart adjusted for inflation from 1980 to 2012 and discovered a pretty amazing picture: since 2000 the index was falling quite rapidly in a perfect channel (I've never seen such perfect four touches of the channel lines by the price on monthly charts!). Right now we are approaching the upper line of this channel, we'll get there around first half of 2013, after which, if the channel holds, the drop in real S&P price will be staggering. Well, it will be the same in amplitude as 2000-2002, which is exactly the same as 2007-2009 (draw this chart, if you haven't seen it). Meanwhile, nominal prices could stay flat or even rise in a hyperinflationary scenario, but that won't be important, when your purchasing power is falling. 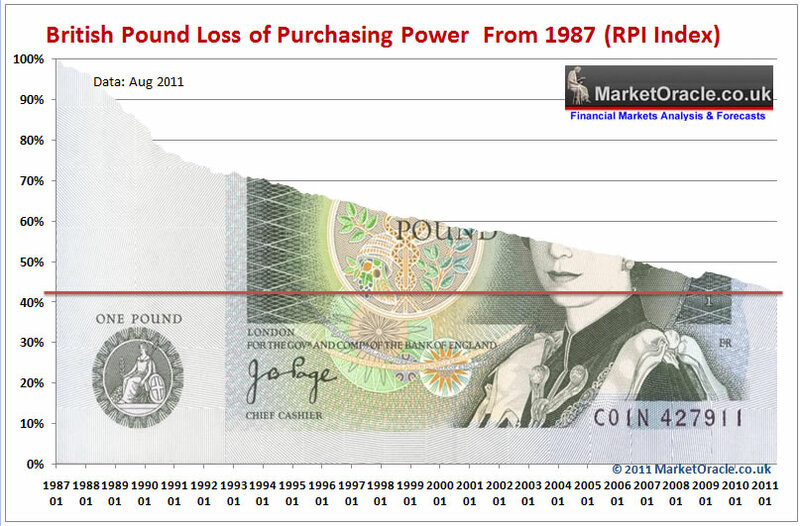 Can it be said that we are indeed in a deflation? Would it be a proper definition of deflation, i.e. when real price is falling, not the nominal? Would you please share your thoughts about this? PS. I'm reading your articles with great interest, they make me think and do all kinds of interesting research. My current focus is on fine tuning the mega-trends. Will look at markets such as stocks after that is done. Your stating aspects of the Inflation Mega-trend which is why prices cannot fall in the long-run and indices such as the Dow are in an long-term inflationary exponential growth spiral, which is why the deflation fools are delusional if they expect prices to fall as a consquence of debt deleveraging deflation which is a red herring as I warned off in November 2009. Deflaiton definition is simple - falling general prices in an economy, which means CPI or RPI, everything else is leveraged to Inflation. The deflation fools play around with the facts such as Mike Shedlock stating that falling prices are not necessary for deflation, what a nonsensical statement to try and get out of the fact that these fools do not have a clue which is why they miss WHOLE bull and bear markets ! They keep blowing like reeds in the wind, once minute its fallign CPI, no wait not that because CPI is not falling, lets pick errr eemmm, the baltic dry dock index while its falling, no can't do that anymore cos its rising now, what about copper ? No thats up, what about US housing ? Yes thats still weak thats what we will pick today to explain were in deflation - FOOLS ! DEFLATION OR INFLATION IS THE MEASURE OF GENERAL PRICES IN AN ECONOMY. 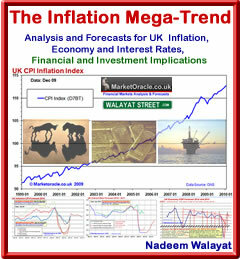 WE HAD DEFLATION FROM LATE 2008 INTO MID 2009 SINCE WHICH TIME THE INFLATION MEGA-TREND HAS REASSERTED ITSELF. DEFLATION IS A MERE RIPPLES ON AN OCEAN OF INFLATION. Listen to the deflation fools and LOSE all your wealth, which is what you would have done shorting stocks for the past 2.5 years ! My goal is not to be right on inflation or anything else, its to preserve and grow my wealth and fundemental to everything I know is that we are in for a decade of above trend inflation! which the past 2 years action is confirming, with all of the consquences for asset prices. I eagerly look forward to reading your articles but I'm still waiting for your analysis on UK housing. My positing is having £60,000 to buy a house but will have to fund £120,000 of it through long term borrowing (10 years at 4%) To me this seems a low risk option as the fear of mega inflation and bankrupting banks. I'd rather have some some in a solid asset and dept to be inflated away. On a previous post you stated don't get into dept during a dept crisis, but surly dept is good in a high inflation environment. In Weimar Germany people paid of there mortgages with postage stamps during the period of hyper inflation. I'd appreciate your opinion on the above. All of my analysis is accumulative, each builds on the other, if I skip answering questions then that decreases probability of accuracy. Debt - We are in a debt crisis, you could lose your property if things go pair shaped, so buying with debt is taking a big risk especially in a debt crisis. Housing - Yes housing is leveraged to real inflation - remember that real inflaiton aproximates about 2% above official CPI. I live in a very funny country-Bulgaria, the most hated destination for British property investors.We are in EU, outside of Euro-zone, but our currency is pegged to Euro(if I am using wrong word-the exchange rate is fixed by law and never changes). In short-our economy is in similar condition as Greek one, but public debt is pretty low-about 16 percent of GDP.Private one is big-about 110 % of GDP, mainly result of property baloon, which is already deflating with about 8-9 % p.a. I would appreciate Your opinion on the question is it possible in such a conditions we to experience proper deflation and after that-some banks to go belly up, bank run, unleashed currency and 'perfect storm'? The current account of the country is negative and has already been like that for 3 years, the biggest banks are Greek, Italian and Austrian and are withdrawing money out of the country with rate about 1 billion Euro per year, GDP of the country is about 20 Billion Euro. I understand, that this question is outside of Your usual articles, but here our government use 'smoke and mirrors' strategy all the time at great scale and it is very hard for the people to understand what is coming in the near future. In the same time You have a lots of readers in Bulgaria and they are waiting for Your opinion!Thank You in advance! Don't be fooled by government Deflation smoke and mirrors, High Inflation WILL come to hungary more so given the fact that its not in the euro. Protect your wealth accordingly, cos no ones going to come and bail you out Greece style. It is different country -Bulgaria, but it probably does not really matter. Most of the people, which still have some money keep them in GBP , Euros or Swiss franks outside of the banks. I do the same and I am trying to buy some business property without debt for my own small business.Providing that we do not have inflation linked bonds or really liquid gold or share market this looks for me as best option.If I fail for some reason-I will be back in good old UK. Nadeem, just wanted to thank you for taking time and responding to me personally. I really enjoy and appreciate your work! With half of Q1 2012 already over, we eagerly anticipate your next update on the inflation megatrend and impact on stocks. Your recent silence has us intrigued.